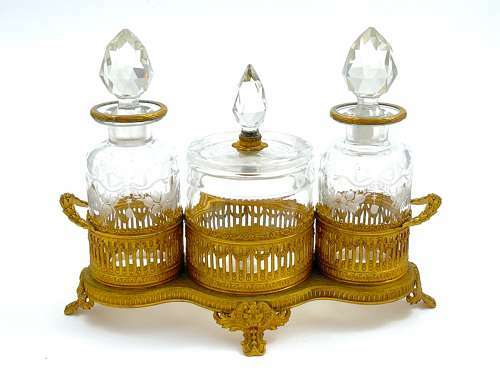 Antique French Crystal and Dore Bronze Perfume Set. The Set Comprises of 2 Perfume Bottles and Stoppers and a Bowl and Cover. Each Piece is Finely Engraved with Flowers and Bows. The Crystal Set Sits in a Fine Dore Bronze Stand Chiselled with Swags and Rests on 4 Scroll Feet. The Handles are Formed in the Shape of Flowering Garlands.